Paris… say the word and most people (especially women, amirite?) get a dreamy, faraway look in their eyes. It truly is a magical place. From the beautiful art everywhere you look and incomparable culture to the gorgeous architecture and out-of-this-world food, it’s likely on your bucket list if you have yet to go and experience the City of Lights. Or, just haven’t been in awhile. 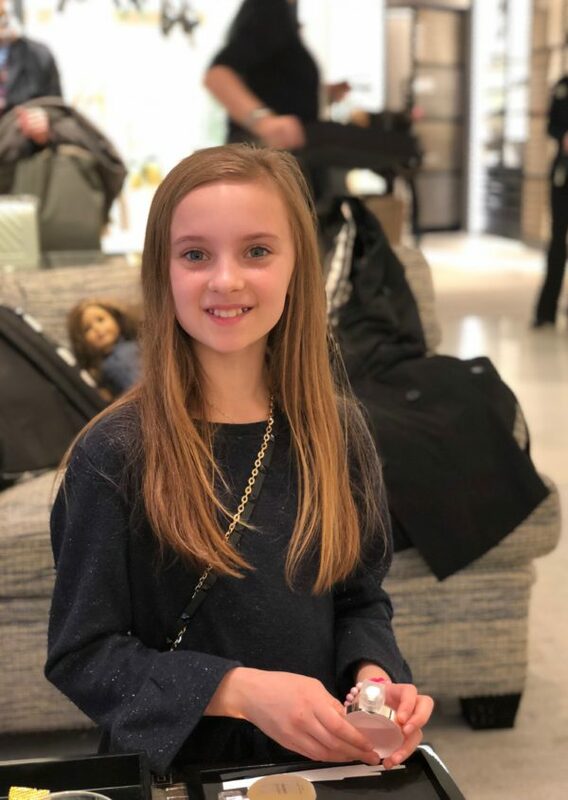 And, let’s not forget the shopping… it is like no other. 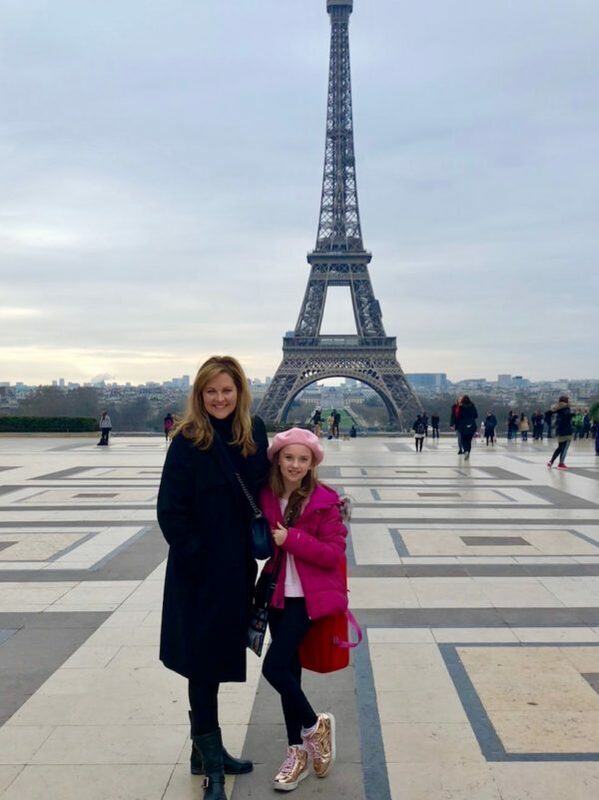 I recently took my daughter for spring break — girls’ trip! — and we had the most incredible time. 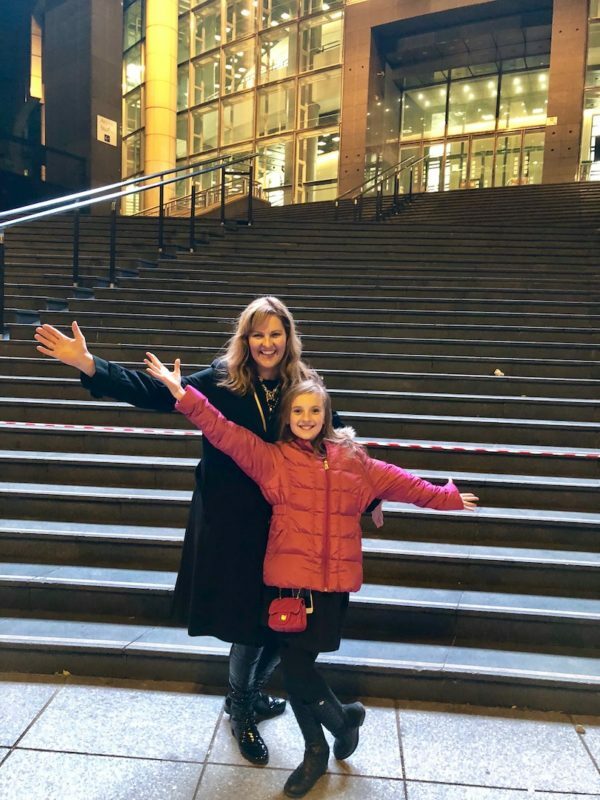 A number of you have asked me what we did on our trip and if I have any recommendations, especially when going with your kids… so here goes! I started this rather lengthy post with a recap of what we did on our trip, followed by travel tips and things to do before you leave. We flew direct from LA to Paris, hoping to avoid weather delays and transfers at JFK or Heathrow, so we flew from Phoenix to LAX, which makes for a long, but doable, travel day. As you would with any long flight (LA to Paris is 11 hours! ), bring activities and snacks for your kids and double the usual allocation. Books, iPads, journals (extra points if you can get the kids to write or draw about the trip! ), and download a few new apps and movies of their choice. Our plane… it was huge! The Airbus A-380 is the largest passenger plane in the world. DAY 1: We flew overnight on Air France and landed late morning at Charles de Gaulle airport. 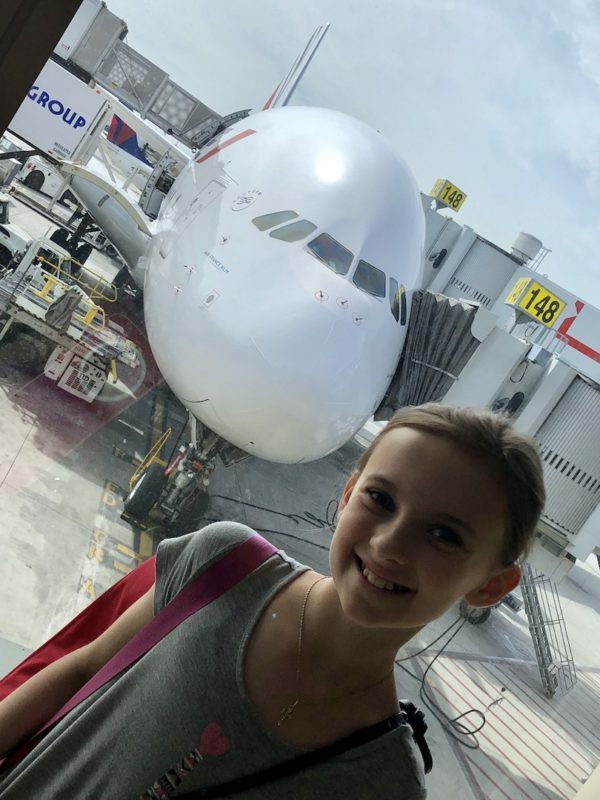 This inflatable travel pillow was the perfect thing to have for resting on the plane and at the airport — especially when you have a very tired kiddo and our flight was delayed on the way home… I highly recommend it! It’s easy to inflate and deflate down to a little packet you can stuff in your carry-on. 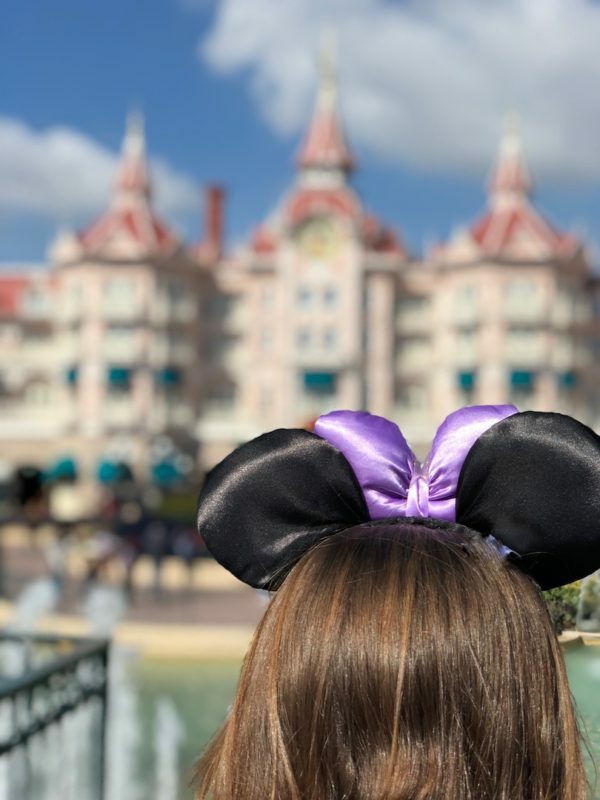 We took a hotel shuttle to Disneyland Paris to spend the rest of the day and the next morning in the park before we headed into the city. We stayed at the Disneyland Hotel, which is pricey but well worth it, since you step out the door and basically into the park. For all you thrill-seekers, the best ride by far was the Rock ‘n’ Roller Coaster! It’s an indoor high-speed coaster with corkscrews and loops, featuring a laser light show and Aerosmith music while you fly through the darkness. Awesome! Only for kids and adults who enjoy this sort of thing, of course. If your kid doesn’t like Space Mountain, this is not for them. The Walt Disney Studio Tour is also neat and similar to Universal Studios in that there is a part where you get to experience live special effects. It’s for everyone. Outside of our hotel with the Assemblée Nationale in the background. Giorgio and Olga welcomed us to the Hôtel Bourgogne & Montana. DAY 2: Off to the city! Our hotel concierge lined up a van to take us to our hotel in Paris — about a 45-minute-drive. 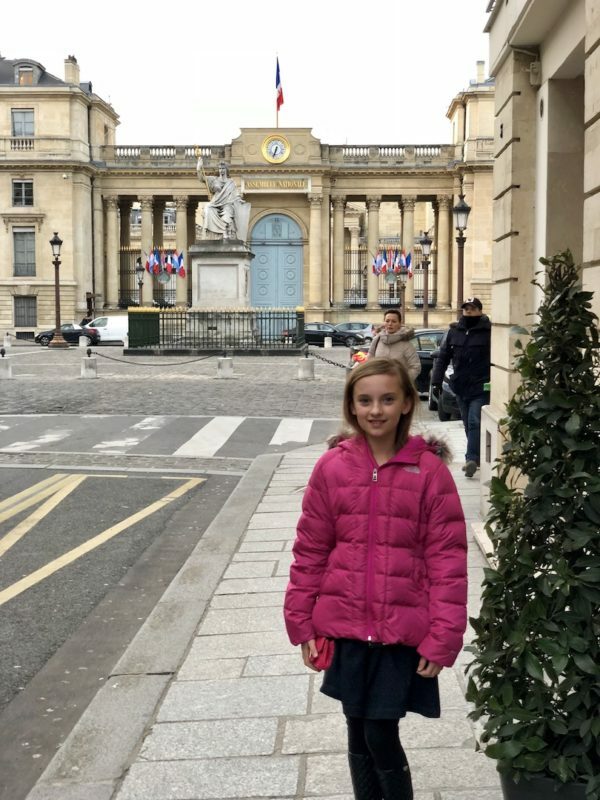 We stayed at the Hôtel Bourgogne & Montana on the Rue de Bourgogne in the 7th District, near the Assemblée Nationale (the Lower House of the French Parliament), and can’t say enough good things. The staff was super friendly and helpful, and the rooms were modern and good-sized. The hotel is in a great location for walking to several museums, shopping and the Eiffel Tower too. There was a lovely bakery, Maison Pradier, across the street for coffee and morning Nutella croissants (insanely good), plus Le Bourbon brasserie was on the same plaza and the food was delicious. We ate there several times and the staff was terrific. 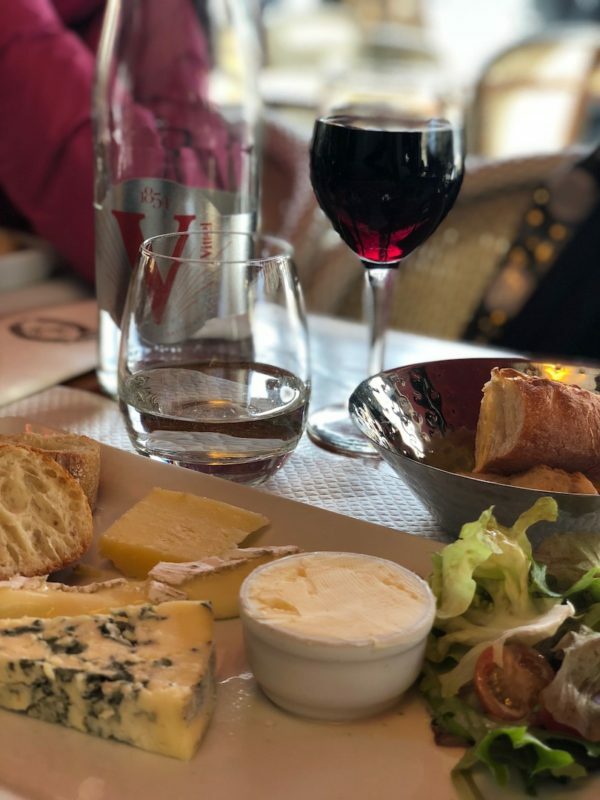 The first day, while noshing on a cheese plate and the adults were enjoying a bottle of wine, the prime minister of France sat down at the table next to us with his bulletproof vest on! (There were a number of worker protests and strikes going on while we were there, plus in the South of France there was a terrorist attack the day before we left, so I imagine he was on alert.) Our first night we headed down to the Opéra Bastille for a performance by Ballet de l’Opéra, choreographed by renowned dancer Benjamin Millepied and Maurice Béjart. I have to say that I’ve been to a lot of ballet performances over the years and this one (contemporary in nature) was one of the best I’ve ever seen — so moving. Not that I’m surprised, mind you, since we were after all in Paris. 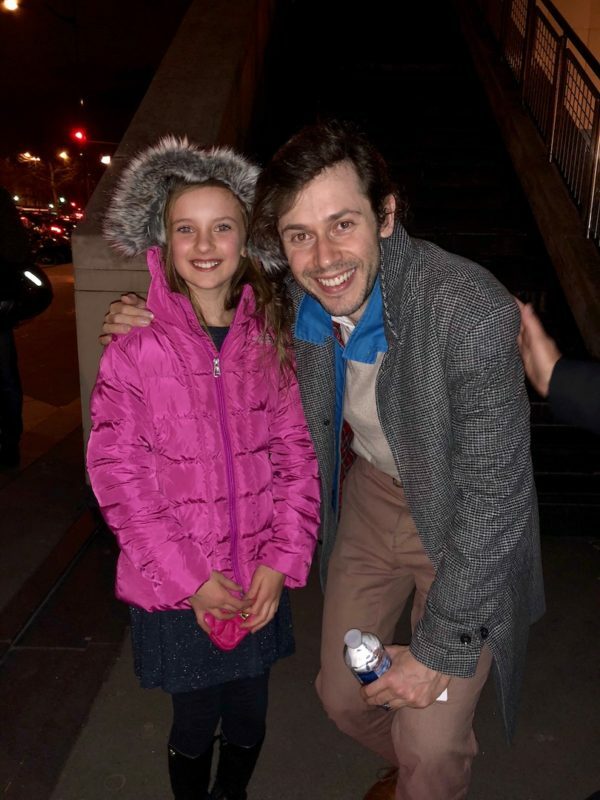 Following the performance, Christina was thrilled to meet the talented conductor of the orchestra, Maxime Pascal, and get his autograph. 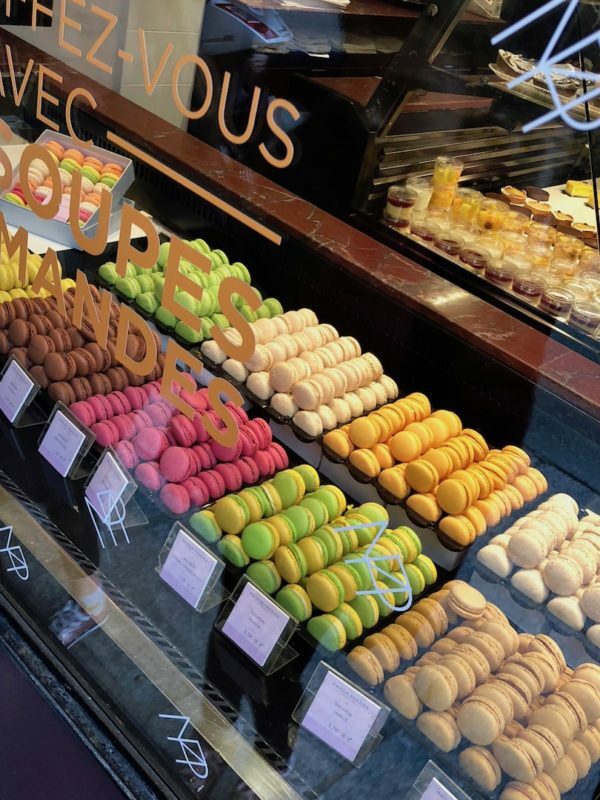 The yummy macarons lining the window of Maison Pradier. Wine and cheese at Le Bourbon. When in France! Meeting award-winning orchestra conductor Maxime Pascal. In front of the Opéra Bastille. 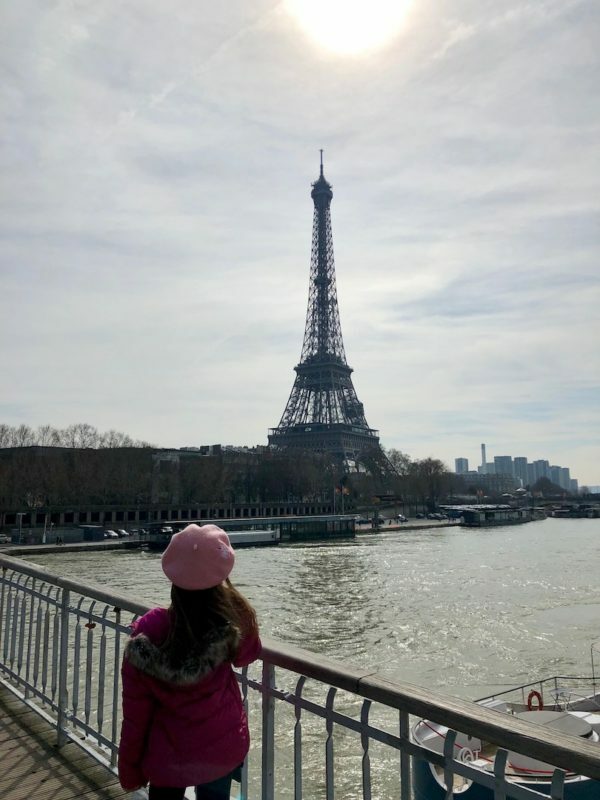 Day 3: The Eiffel Tower is naturally a must-do when in Paris. We walked from our hotel, which took about 20 minutes, however we missed our tour that we’d arranged ahead of time with Paris CityVision, since we were late and the office where we were supposed to meet the tour guide was closed. Apparently they only meet you there at your designated time, then walk you over to the Eiffel Tower. Fortunately for us there was another tour office next door that was open and we were able to get in on their group. A skip-the-line tour for the Eiffel Tower is recommended and I can see why, since at the base of the structure the line for tickets was huge! And, there is a bunch of construction going on around the base in preparation for the Olympics 2024. My advice regarding all tours: Allow extra time to find where you are going or just take Uber to get to the location on time and walk back. 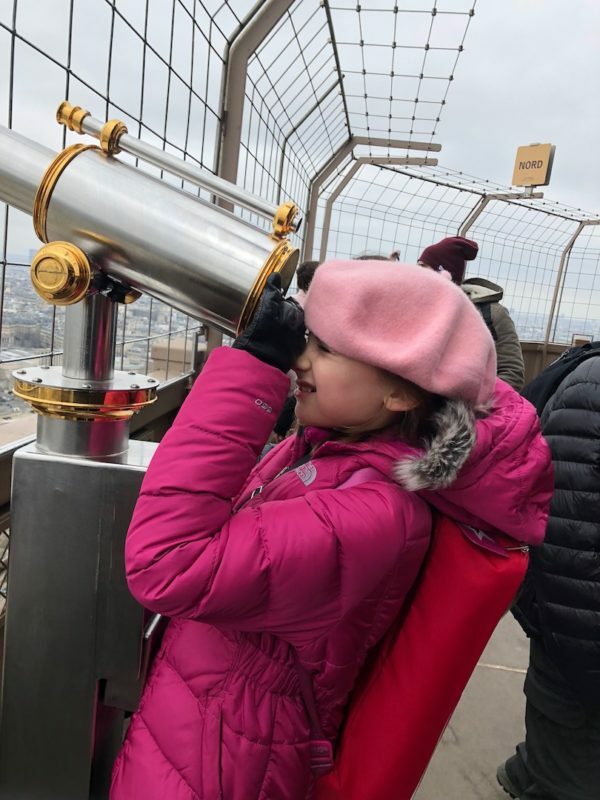 On the viewing deck at the Eiffel Tower. It was cold and windy! 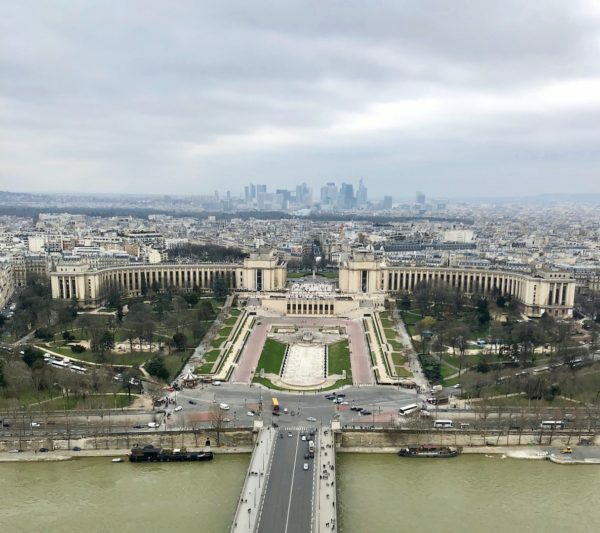 View of the Trocadéro from the Eiffel Tower. Day 4: A former palace and the world’s largest art museum, the Musée du Louvre was flat out amazing. 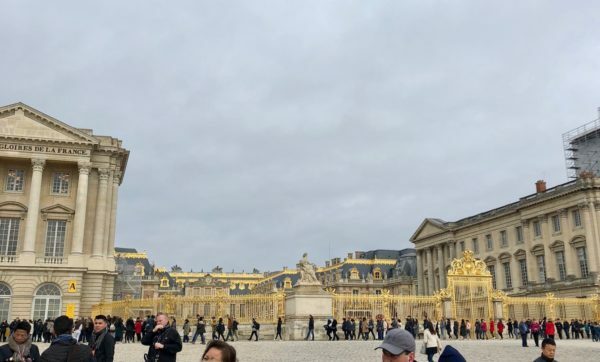 If you ask Christina, it was one of her favorite days, along with Versailles. We had a skip-the-line tour that was designed for families by Paris Muse, which I highly recommend. 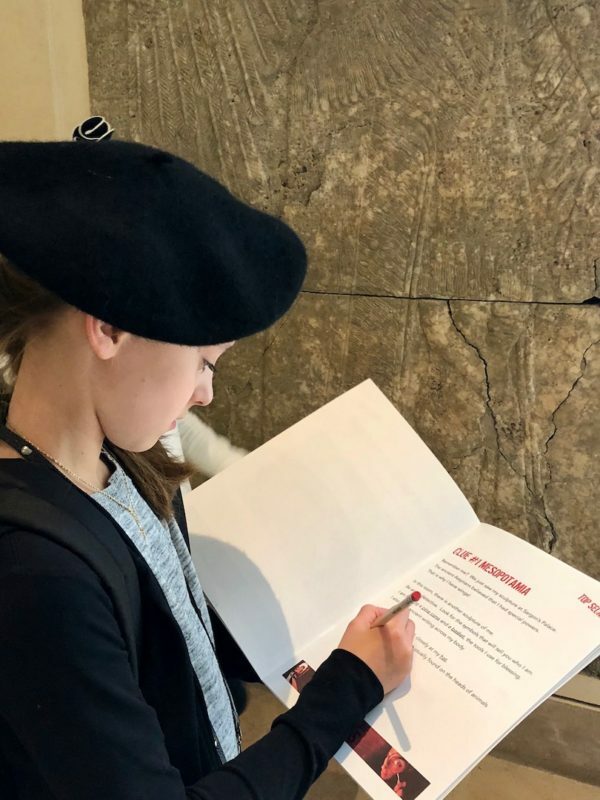 The tour guide was excellent and they provide a book for kids that keeps them engaged looking for clues around the museum, while the guide takes you around to the most popular and important works of art, such as the Sphinx, Venus de Milo, Mona Lisa, etc. We learned so much history about each piece — it was fascinating. 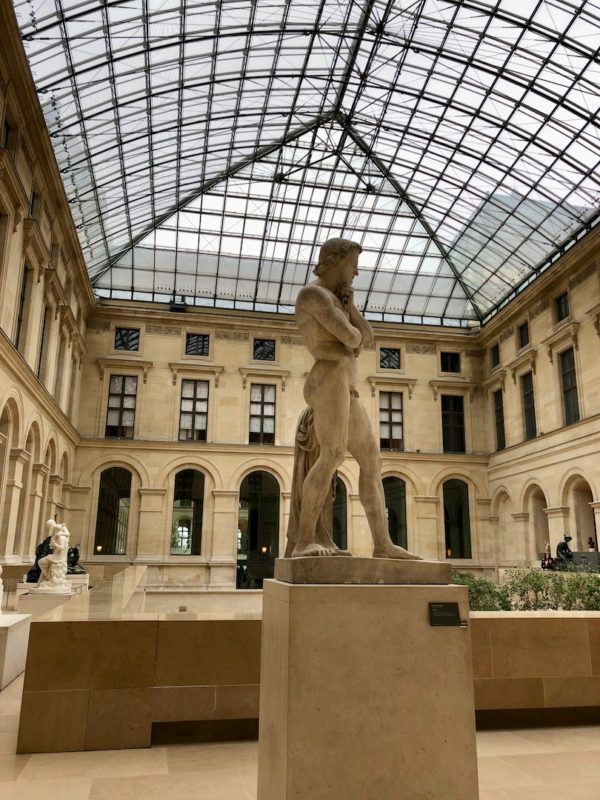 The guide mentioned that to see the entire Louvre collection and look at each piece for 30 seconds, it would take you two months. Wow. After the tour, you can choose to walk around longer as well. 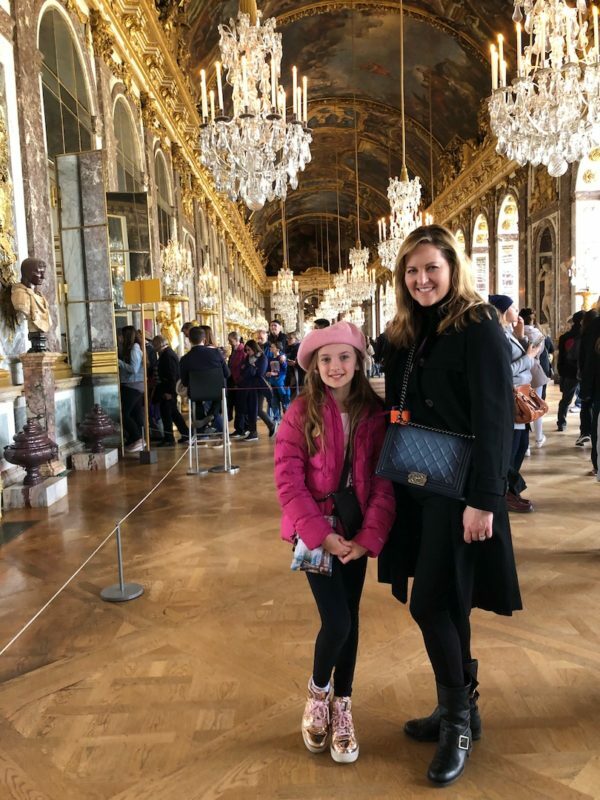 Although, after the tour, we were ready for a break, so headed out for a little lunch and decided to spend some time just walking around and soaking up the Parisian culture. With kids, it’s important to set your expectations and prioritize what you really want to see each day, and then build in some free time to wander around and of course eat. One of the stunning galleries in the Louvre. 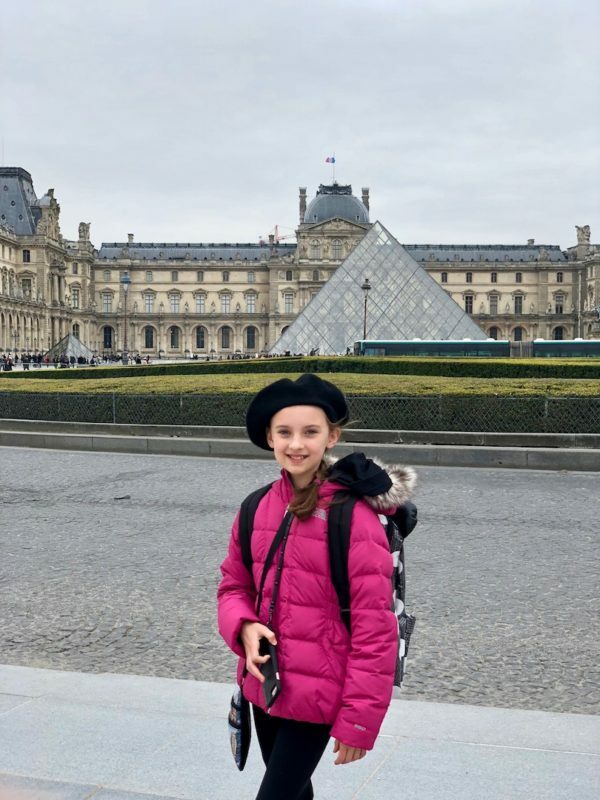 Looking for clues in the Louvre scavenger hunt. 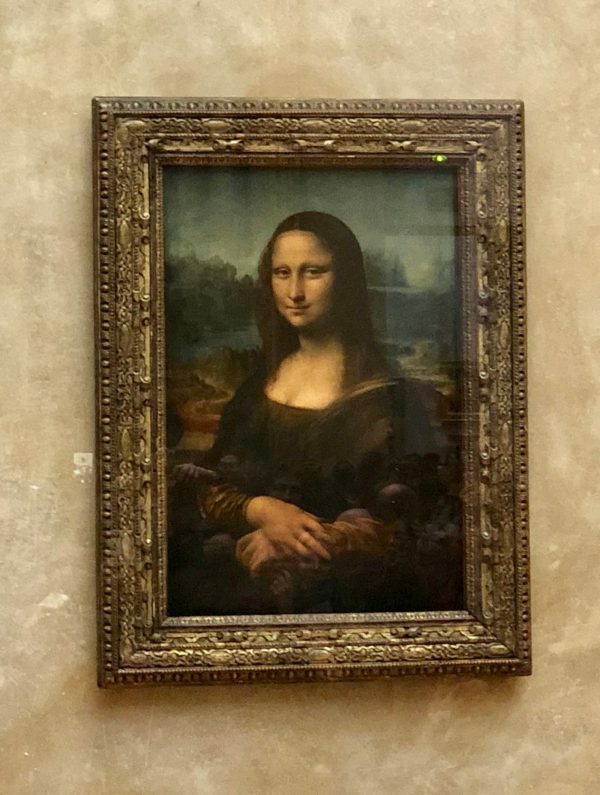 The Mona Lisa is naturally a must-see piece…. 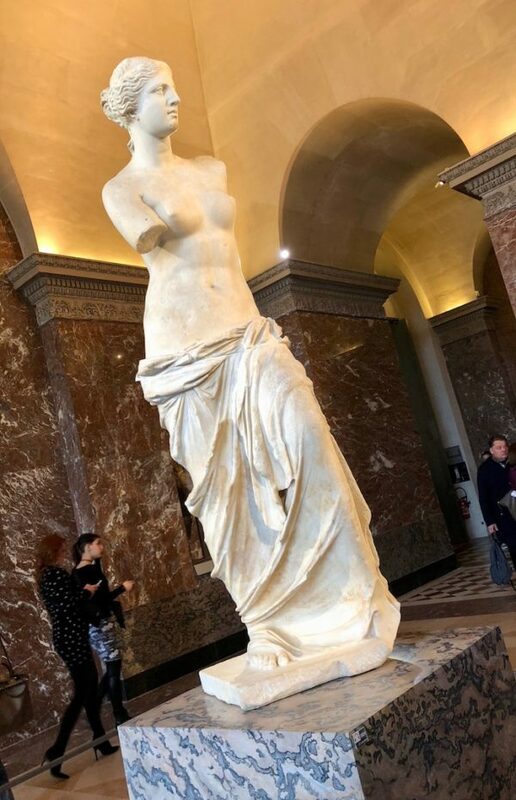 ….and the Venus de Milo. 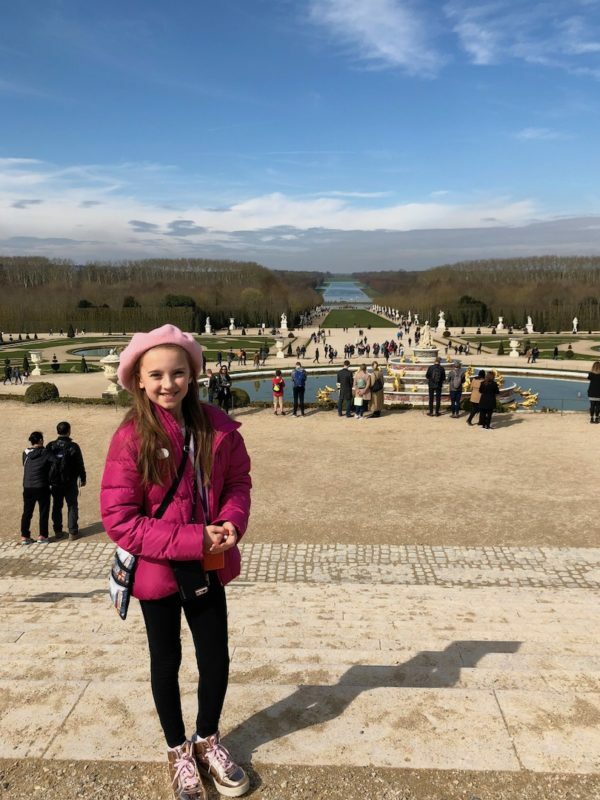 Day 5: Our day at the Palace of Versailles was another trip highlight and a magical experience. We booked a skip-the-line tour through City Wonders, which was recommended by a friend and well worth it. 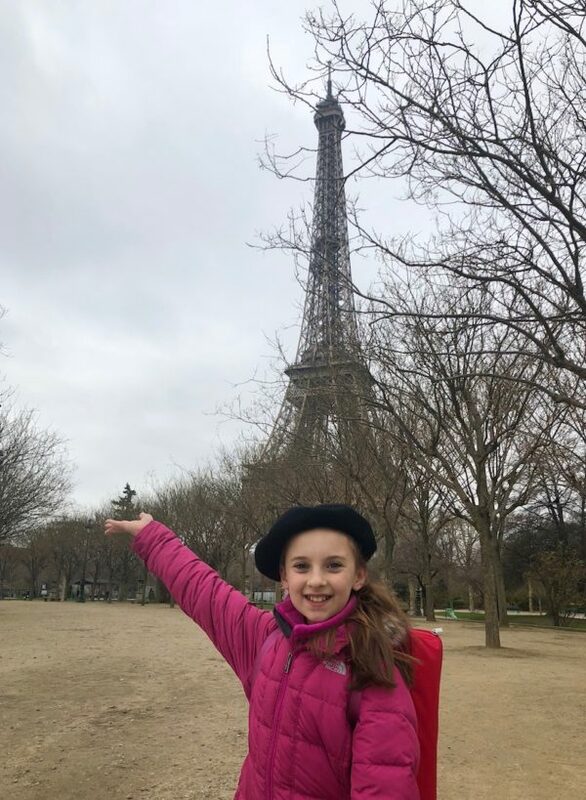 We met City Wonders at the Trocadéro (the best place to get your picture with the Eiffel Tour — gorgeous!) and a motorcoach drove us to Versailles (about a 45 minute ride). Lucky us, we had a sunny day to enjoy the exquisite palace and grounds. Our tour guide was fabulous and full of stories about the palace, French history, the artwork and royalty. Each room is more beautiful than the next, and, needless to say, Christina was ready to move in at the end. LOL! After the guided tour, we wandered around the gardens and took pictures. As enormous as the palace is, it is small compared to the size of the grounds! At the Trocadéro before leaving for Versailles. The main gate at the Palace of Versailles. One of the gorgeous ceilings in the palace. Overlooking Versailles’ expansive gardens and land. It was a beautiful day, but sadly the fountains weren’t on due to the cold weather. 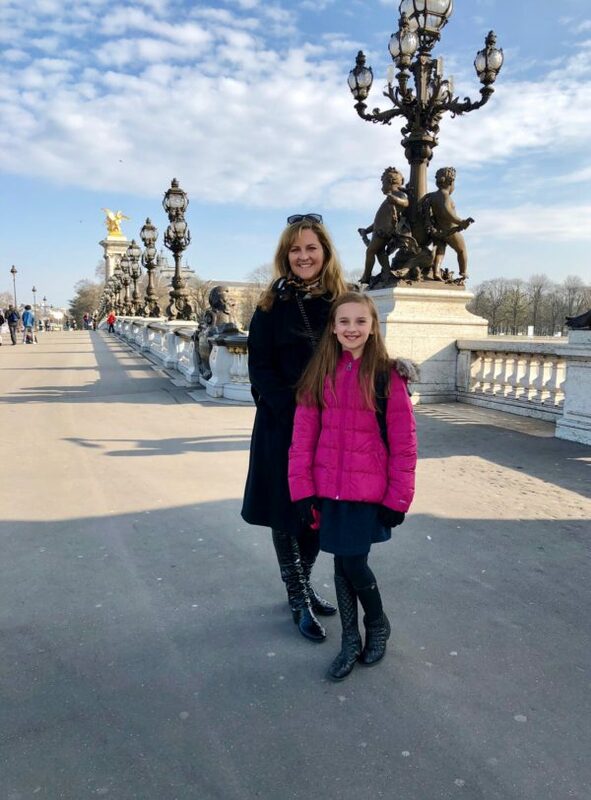 After we arrived back at the Trocadéro mid-afternoon, we decided to walk back to our hotel and take in the beauty of the city. 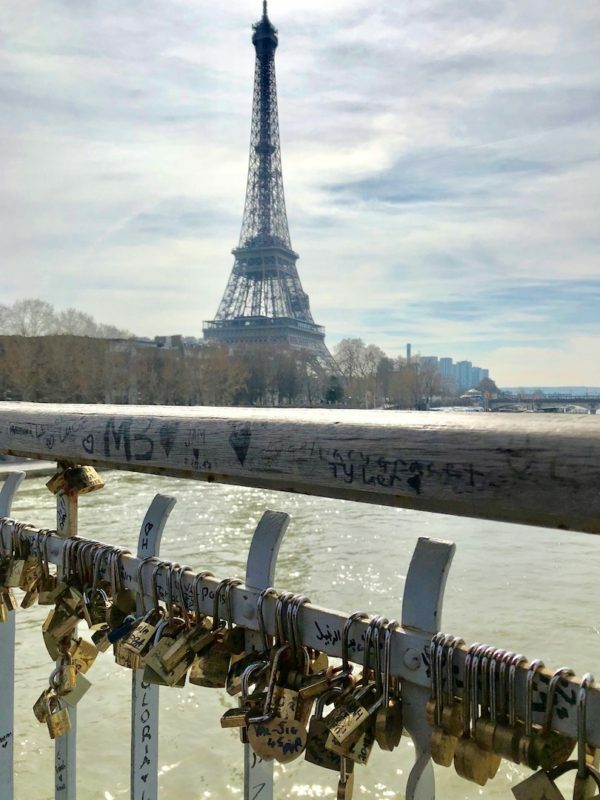 We crossed over the Seine River on a pedestrian bridge featuring locks with love notes written on them — so romantic — and naturally a view of the Eiffel Tower. 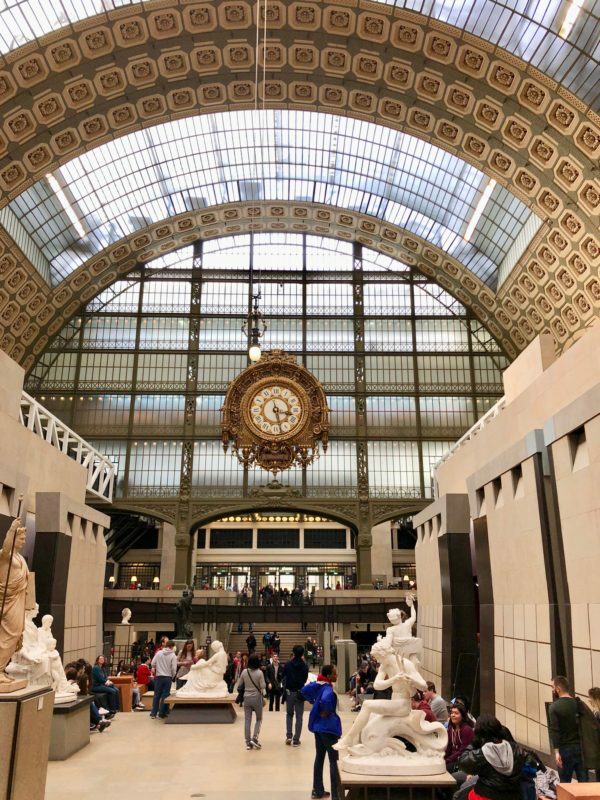 We walked past The American Church in Paris and stopped at the Musée d’Orsay for a look at the Impressionists. Everything about the d’Orsay was amazing from the building itself — an old train station — to seeing all these works of art I’ve studied and admired over the years in person. An art lover as well, Christina enjoyed every minute. 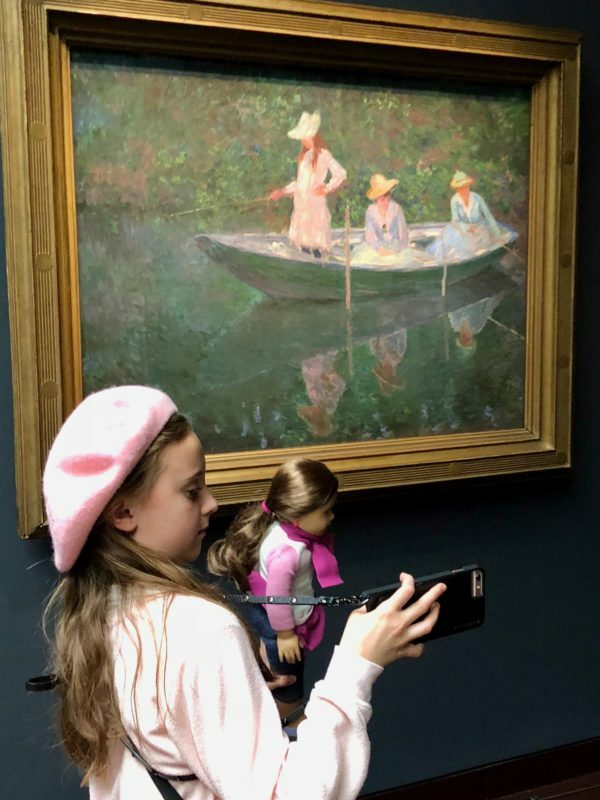 It helps that she is familiar with many of the artists (Monet, Cézanne, Renoir, Rodin, Degas, Van Gogh), so if taking your kids to museums is on your list, it’s a good idea to have them read about or look at the art they’ll be seeing in advance, so they’ll be more fascinated by what they’re taking in. The museum cafe is worth a stop as the design is very cool and the tarts are delish. “Love locks” on the Pont des Arts over the Seine. People write sentimental notes on the locks, then hang them on the bridge. The city took the locks down at one point, but have since put them back up. 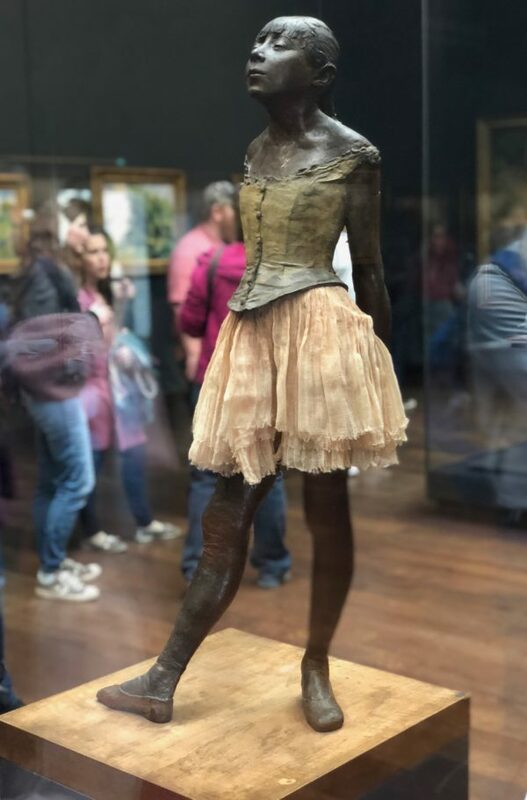 The famed Small Dancer by Edgar Degas. Gallery room at the Musée d’Orsay. 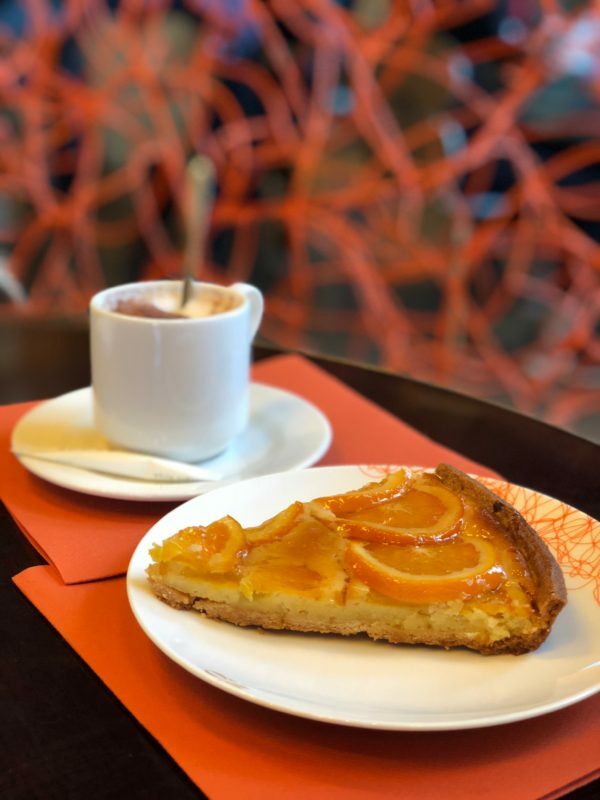 A orange tart at the Musée d’Orsay cafe. Day 6: A more relaxing day after all of our tours and sightseeing, we enjoyed a French brunch with our friend’s Parisian family, followed by a special Bach concert at a local church. The pianist was insanely talented and it was a great way to take in some of the local French talent and culture while we were there. A view down the Seine from the Pont Alexandre III bridge. 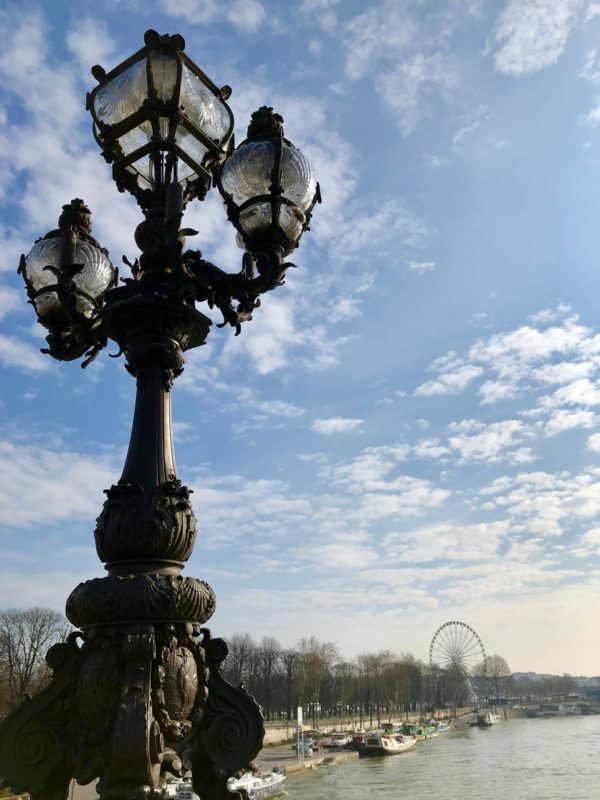 The beautiful Pont Alexandre III bridge. Day 7: Our last full day in Paris was reserved for… you guessed it…. shopping! 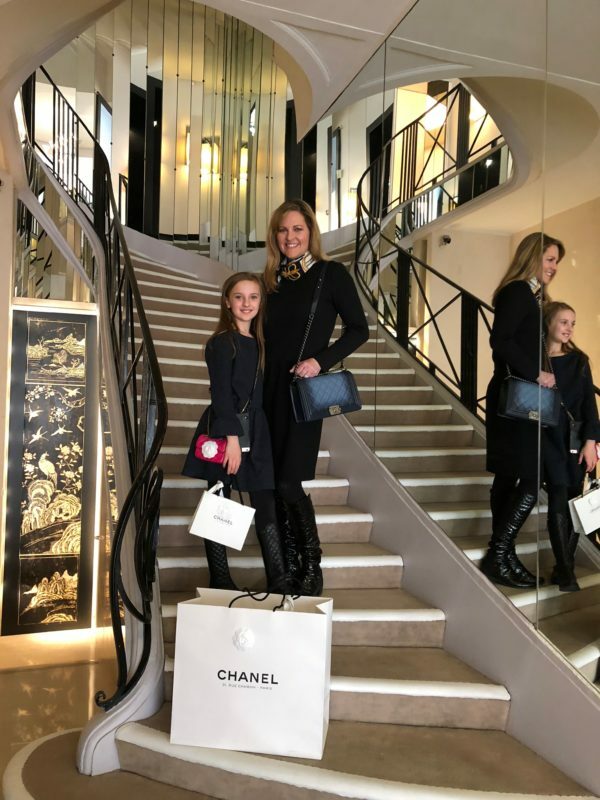 We started the day with an appointment at the Chanel flagship store at 31 Rue Cambon. So many beautiful pieces and a number that are unique to the Paris boutique. 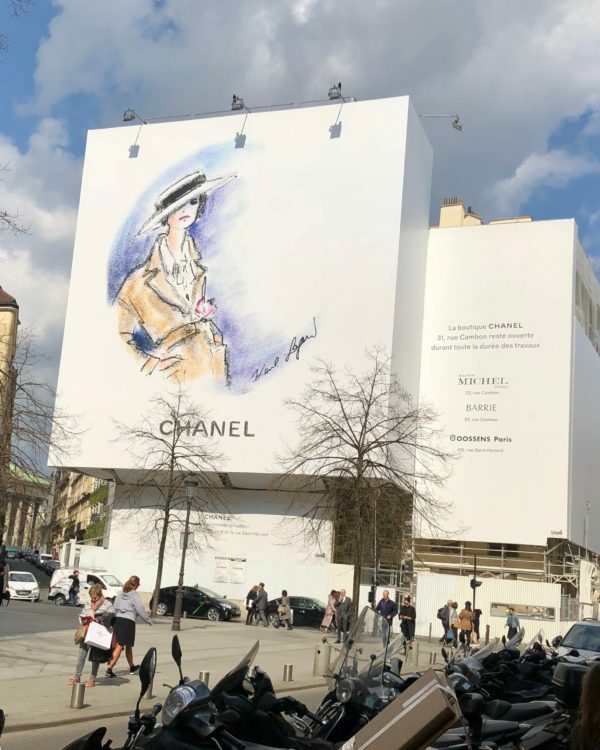 The building where the Chanel flagship store is housed; they are doing some repairs so there’s a temporary facade over the front. On the famous staircase that leads to Coco Chanel’s apartment. 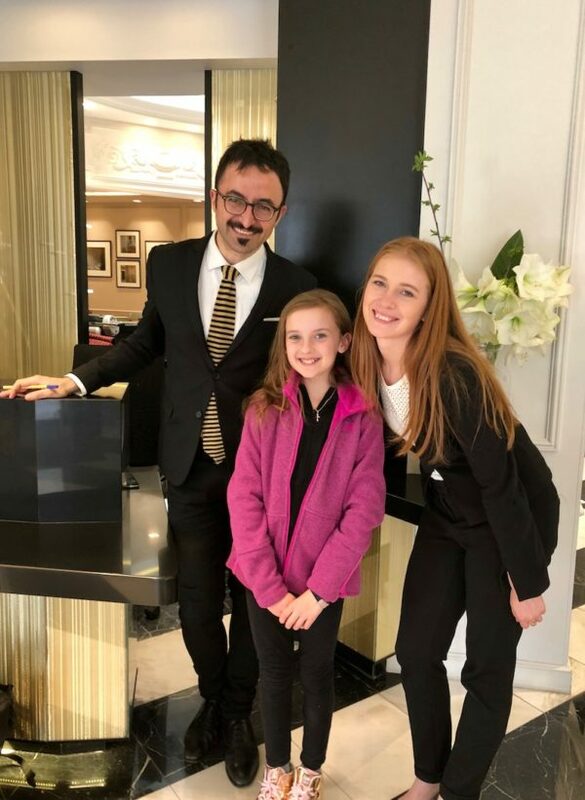 After a successful shopping spree, we enjoyed lunch at Flottes near Chanel and spent the remainder of the afternoon walking on the Champs-Élysées and down the Rue Saint-Honoré — so many streets, shops and areas to explore… we can’t wait to go back! Deconstructed salmon ravioli at Flottes — amazing! √ Duolingo is a terrific way for both you and your kids to learn some French before you go and once you’re there. Christina started right when we booked the trip and within a few weeks, she was “30% fluent” according to the app. I will say that she learned more than I did and mastered the accent pretty well, unlike myself. Duo Lingo kept her entertained during the flight as well. Awesome! √ WhatsApp is a great way to communicate via text and phone while you’re overseas without incurring extra charges. You can even send pictures. √ Book skip-the-line tours ahead. It will save you time and you can look for deals. 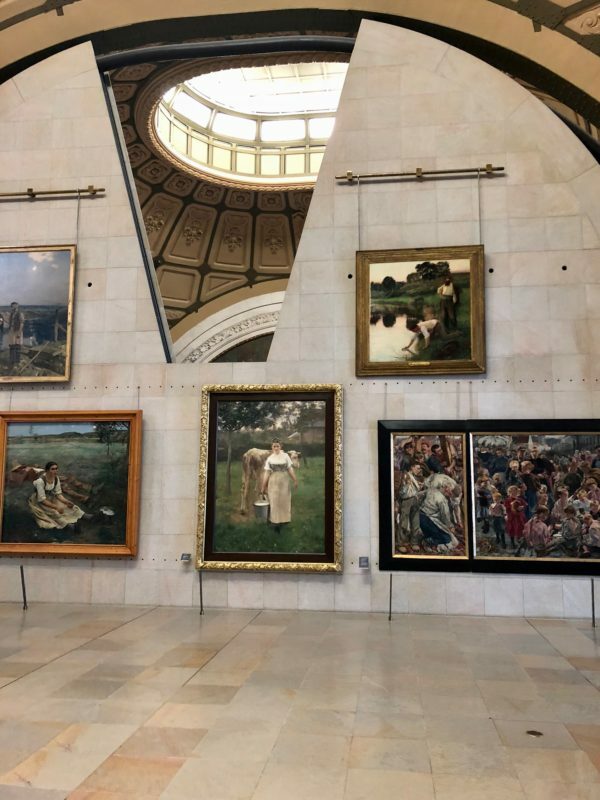 I highly recommend City Wonders for tours. We used them for Versailles and they also offer a Eiffel Tower tour. 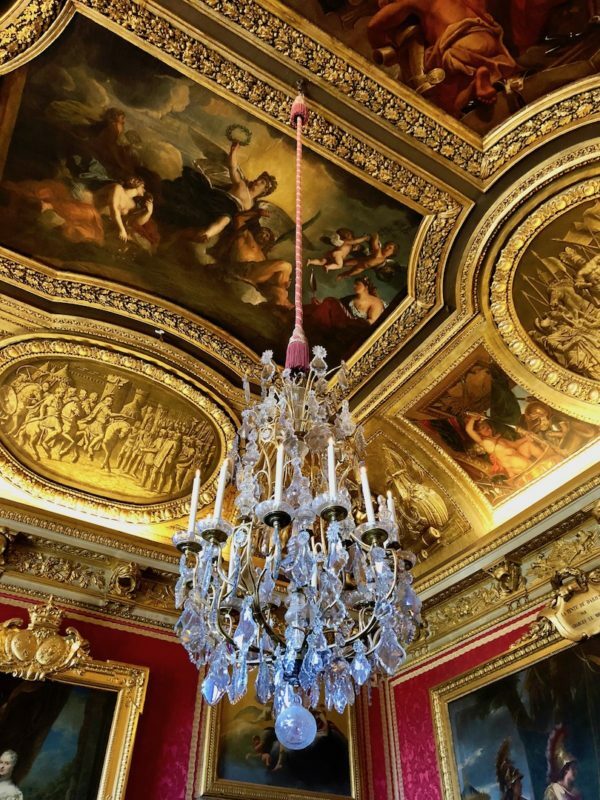 I also highly recommend Paris Muse for the Louvre (there are several different Louvre tours to choose from), plus they offer a number of other experiences as well, including walking tours, Montmartre, Norte Dame and more. Also, if there are any performances you’d like to see while you’re there, buy your tickets ahead. It’s always better to have a certain amount of planned activities when you have the kids in tow and keep things moving. √ Make copies of your passports and put them in your suitcase, plus leave copies at home with a family member or friend. If you lose a passport, a copy makes getting a new one in a foreign country much easier. 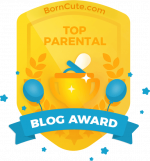 √ Have a notarized letter from your spouse or your kid’s other parent if they are not along for the trip. If both of you are going, no need to worry, but if not, you could potentially be asked for proof that you have permission to take your child out of the country. √ Bring a couple of European adapters to charge your phone, computer, iPad and to use any other electronics such as a hair dryer that you bring along. √ Invest in a travel-size luggage scale. They are well worth it as the airlines are very picky about luggage size and weight for international flights. I used the scale going and coming, and saved myself a $100 overweight fee on the way back as I was able to redistribute the contents of our suitcases. Whew. -Use Uber for getting around town quickly. Make sure your payment method is up to date before starting your trip. -Check with your hotel for rides to and from the airport — this was cheaper than using Uber. 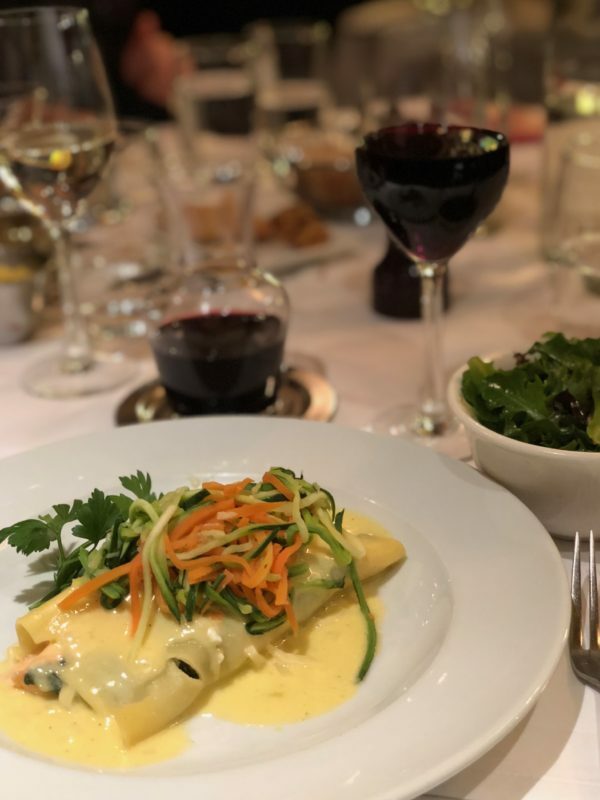 -The food in France is naturally amazing and it’s hard not to get carried away with all the yummy crepes, croissants, bread, wine… the list goes on. To help us eat healthy in between treats, we stopped at an organic grocery store near our hotel and picked up fruit and healthy snacks to eat in our room. This was a big help, especially when I was getting ready in the morning or right before bedtime — you know how kids are, when they’re hungry they don’t want to wait. -If you make a large purchase, such as designer item (just sayin’ – you are in Paris after all), ask at the store about getting a tax refund. Also, be prepared to take your designer item out of your suitcase if customs asks to see it. This happened to me and thankfully it wasn’t buried and I was able to access it readily. -Bring a money belt. I took our passports and cash with me everywhere just to be on the safe side. This money belt was fairly thin so I could wear it under my clothes. -Don’t try to do everything. Prioritize and book the activities and sights you for sure don’t want to miss. Then, have a “B List” of items that you’d like to try to fit in. Make sure to build in time just walking around and taking in the city, the culture, the food, and the art that’s all around you. You don’t want to be so busy that you don’t have time to just enjoy the moments and the fact that you’re in Paris! 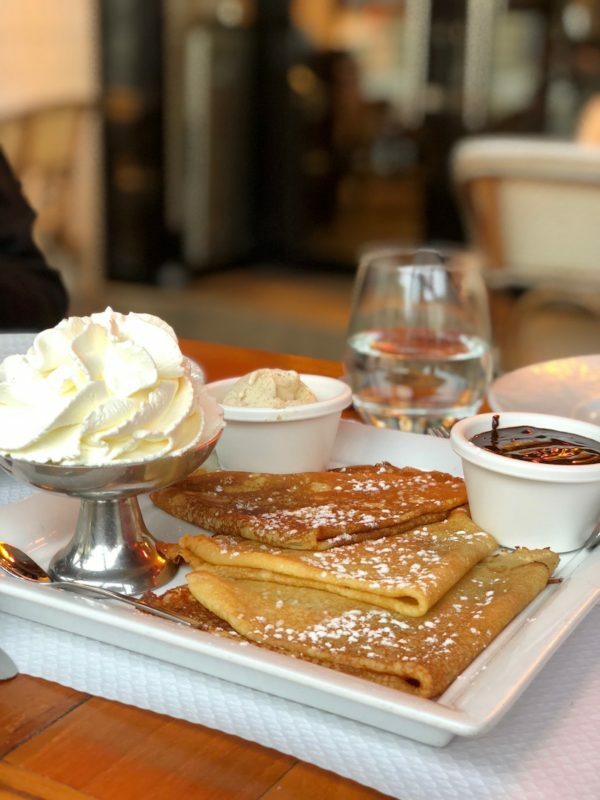 Make time for crepes! These are our favorites at Le Bourbon. So informative and will come in handy for our upcoming trip !